What are the best Pillows for Acid Reflux? The best pillow to alleviate or altogether avoid acid reflux is a wedge pillow that is designed to keep the torso elevated. Stomach acid is prevented from burning through the air passage or esophageal lining during sleep. The best pillows are elevated between 30-45 degrees or 6-8 inches. People who often experience acid reflux are prone to having it when lying on their backs on normal pillows. Remedy for this is easy; just try having something lodged on your back so that you don’t lie flat on your back. More often than not, acid reflux is solved through this, without the need for costly apparatuses and whatnot. A wedge pillow is better than using several pillows stacked together. The latter can be very uncomfortable and it can also flatten after several nights of sleeping with it. Wedge pillow effectively elevates the head, shoulders, and torso keeping the contents of the stomach where they are and not refluxing toward the esophagus. Wedge pillows are recommended for both back and side sleepers, as it doesn’t cause tension around the shoulders and neck. You don’t have to worry about waking up feeling any stiffness. There are tons of effective wedge pillows sold on the market and you don’t have to get them from expensive medical supply stores. What are the recommended wedge pillows for acid reflux? This wedge foam is very affordable and comes in three sizes, depending on the angle and width you want. It comes in standard, 10-inch, and 12-inch high. The gradual incline support makes sure that the height is not that steep, so you’ll still enjoy the comfort of being reclined to sleep. This pillow is recommended for people who experience difficulties in digestion. It also eases breathing and sinus pressure as well as soothes tension around the neck and shoulder muscles and keep them aligned with the spine. The pillow, although a bit bulky, can be folded for easy storage. It comes with a soft velour cover that can be unzipped for easy removal and is washable. What users don’t like about this pillow is that the foam gradually decreases its firmness. 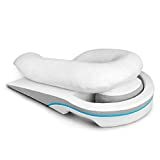 It’s very comfortable and effective during the first few months but it loses its function because the foam becomes too soft to support the back. When the foam becomes too soft, users find themselves sliding down the wedge on their sleep. Consider this before buying this wedge. This wedge pillow is made of memory foam that effectively molds itself to the natural shape of your body. It is made of 100% high density ECO foam that is great for those who experience acid reflux, sleep apnea, snoring, and other pain reliefs. This is a great pillow if you want a lasting one that will support your back for years to come. Owners said that they have been using this wedge pillow for years and it has perfectly retained its shape. Because it is a memory foam, it is also soft and comfortable to sleep on, despite being firm enough to give the right support. The elevation of the pillow is just right; it will relieve those who experience difficulties in sleeping and at the same time make the sleeper much more comfortable. It is measured with the universally recommended size which is 24” long 24” wide and 7.5” high. The wedge pillow includes a washable removable zippered pillow case. The Medslant Wedge Pillow for Acid Reflux helps resolve your symptoms by supporting and elevating your upper body, using gravity to keep acid down and your airways open - helping you breathe more easily and sleep better through the night. 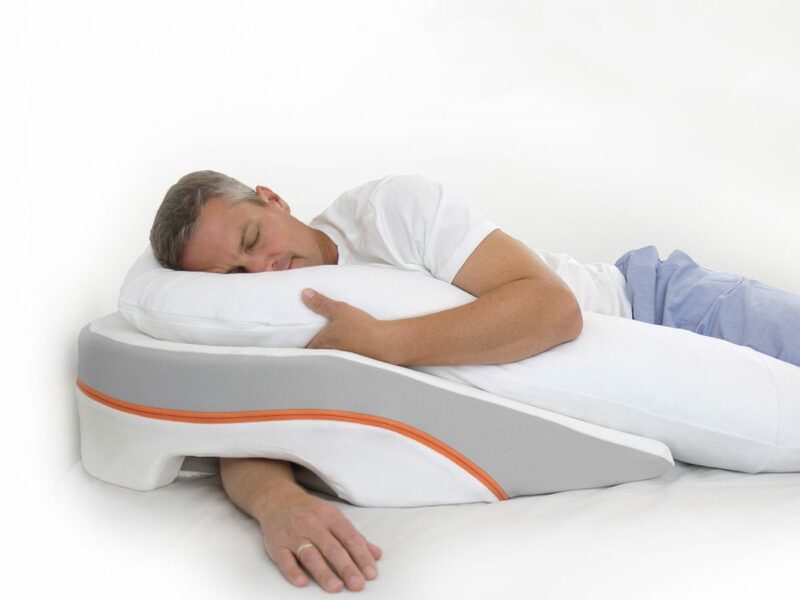 This pillow is especially made for people who experience acid reflux, sleep apnea, and snoring. Because of its firmness, it effectively elevates the upper torso, using gravity to keep acid down and your airways open. The foam is made of hypo-allergenic, eco-friendly soy/polyurethane that is firm enough to support the weight of your body but soft enough to be as comfortable as lying on your mattress. This pillow, although bulky, can be easily taken anywhere because it can be folded and placed in its accompanying eco-friendly PEVA carry case. Now you don’t have to worry about uncomfortable nights during your travels as you can take this pillow anywhere. The pillow is enclosed in a sheet cover made from poly-cotton so holds it’s shape and fits perfectly even after several washes. The manufacturer, MedSlant also has great customer service for when you run into difficulties. GRADUAL INCLINE. The length of MedCline LP allows for a gradual increase in elevation so that you don't feel as if you are sleeping at an angle. MedCline LP props you up just high enough to take the pressure off your downside shoulder and arm. The full-length body pillow can be pulled between your knees for added lower back support. ✅DESIGNED SPECIFICALLY FOR SIDE-SLEEPING COMFORT. The patented arm pocket at the top of MedCline LP is symmetrical so that you can sleep on your right OR left side. The adjustable small insert pillow within the arm pocket is filled with shredded memory foam for your comfort. Our flexible design allows you to find your most natural and comfortable arm position. MEDICAL-GRADE MATERIALS FOR QUALITY, SUPPORT, AND LONGEVITY. Most standard bed wedges are just a singular foam type cut into a triangle. MedCline LP wedge is constructed with FOUR types of medical-grade foam, strategically placed and layered for maximum support and product longevity. The top layer is memory foam for added comfort. This pillow comes as a set for complete acid reflux relief. It’s pretty expensive than the rest of the products reviewed her, which is double the price as the previously wedge pillow. The set contains a lot of pillows (not just one) that are connected to each other to bring you an ultimate reflux-free sleep. Medcline specifically created this system for those who experience nighttime acid reflux, heartburn, and GERD. The sleeping system not only contains a wedge where your upper torso will be resting, but also pillows for your head and back. These help with keeping the neck and shoulders in line with the spine as well as relaxed. The sleeping system is totally different from the simple wedge pillows that have been reviewed here as it comes with an entire set that can be used in more ways than one. If you’re not happy with your purchase or feel like this system is not for you, the manufacturer has a 30-day money back guarantee. You don’t have to endure acid reflux during your sleep as merely just improving the way you sleep can solve it. The best pillows for acid reflux worth checking out are wedge pillows that elevate your body to keep the acid right in your stomach. These wedge pillows are engineered for this purpose so you won’t have to worry about it being too high or too uncomfortable.